You don't really need this skirt (and you have another FN off-white skirt you bought almost 2 years ago & have never worn), so you're confused whether or not to buy it. 30% buy, 70% don't buy. Then a girl wearing nothing but a white banyan (under shirt) pops out of a trial cubicle & asks you if you're buying the skirt. You're terrified! "YES. WHY?" clutching the skirt tighter. Girl in banyan: A little embarrassed & right hand on chest "No... I'm just asking. If you're not buying then I'll try it on"
Yes, you're buying it. You just needed a minute to think. 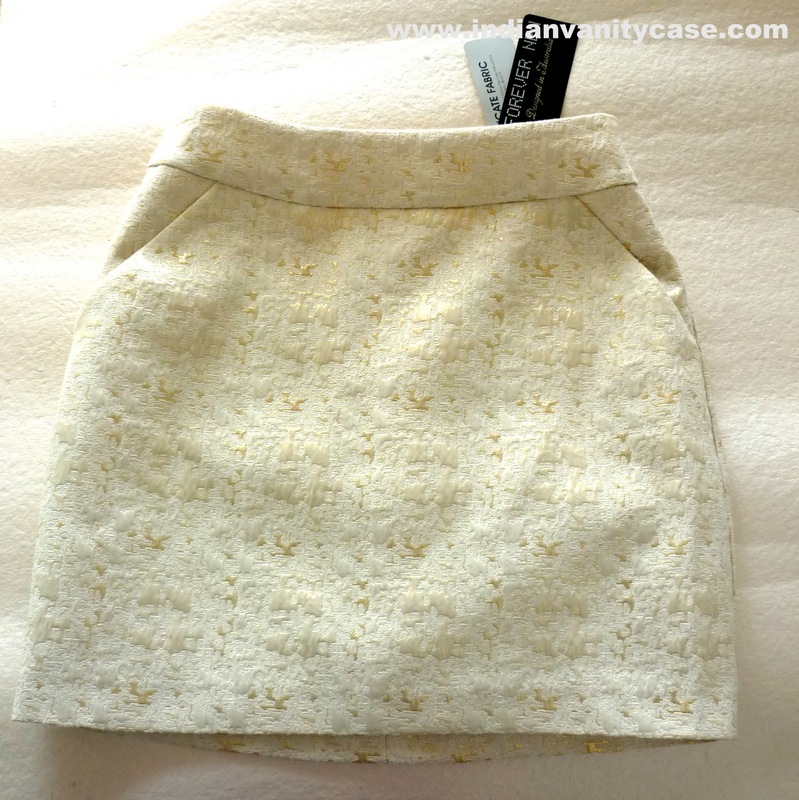 I think it would add some casualness & "cute" to this rather formal-looking skirt. Now I just need to find a top that would go with those. I'm thinking plain off-white sleeveless georgette with a little bit of ruffles. By the way, the Forever 21 earrings go really well with this skirt. Total ~ Rs.1050. Best/Cheapest buys from Forever New! Where do you think the bow looks best? Sorry! Something went wrong with my previous comment. The skirt looks gorgeous with the bow! 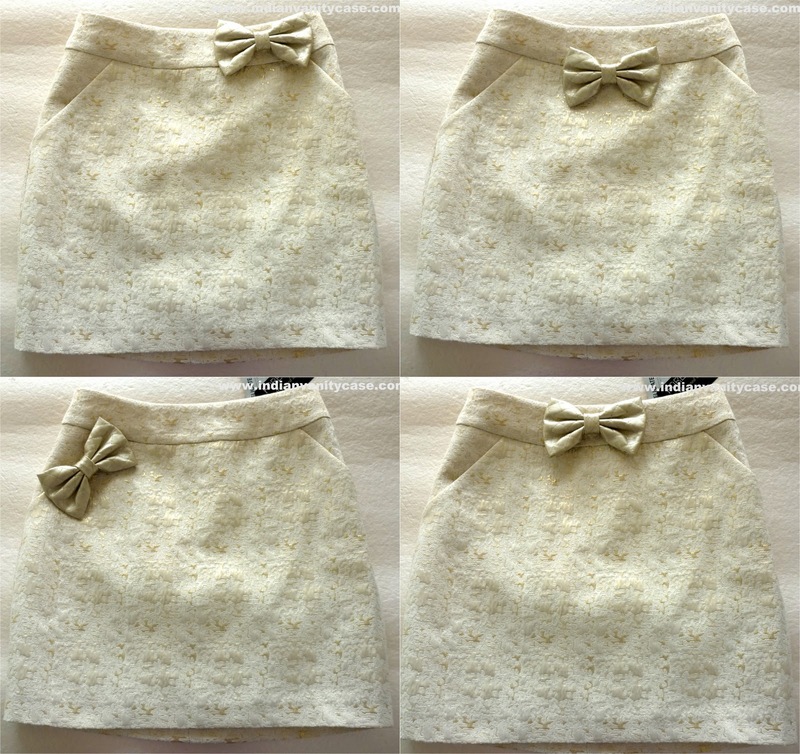 I think it's positioned the best in the 2nd pic (centre of skirt, just below the waist band). So cute with the bow! Omg the skirt is stunning..Lucky you cynthia. & the bow..how can we never like those cute lil things! As for the top why dont you try something colorful to go with this skirt or even a black ruffled top would look lovely on you! ha ha ha!! anything becomes more tempting whn someone else also wants to get that. Believe me 95% girls would do the same no matter how many similar skirts we have in their wardrobe. I loved your buys!! That bow adds the perfect touch!